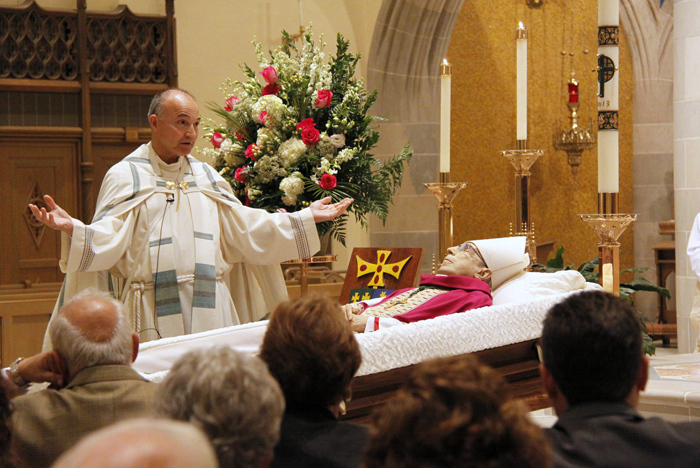 GREENSBURG, Pa. (CNS) — Retired Bishop Anthony G. Bosco of Greensburg was remembered for his humble nature, wit, and dedication to teaching the Catholic faith at his funeral Mass July 10 at Blessed Sacrament Cathedral in Greensburg. Bishop Bosco, who was a bishop for 43 of his 61 years as a priest and was bishop of Greensburg from 1987 to 2004, died July 2 at his home near Greensburg. He was 85. The Mass was celebrated by Archbishop Charles J. Chaput with Greensburg Bishop Lawrence E. Brandt as concelebrant. Msgr. Roger A. Statnick, who was vicar general during most of Bishop Bosco’s episcopacy, was the homilist. In his opening welcome, Bishop Brandt extended sympathy to Bishop Bosco’s family, especially his younger brother, Jim, and his wife, Sharon. “We pray together in thanksgiving to God for the time he was ours as the good shepherd of this Diocese of Greensburg. Likewise, we lift up his great works to the Lord that goodness and mercy be shown to him, and that he may rest in the Lord’s embrace,” Bishop Brandt said. “Bishop Bosco’s legacy is not about what he did and said, but what God did and said through his leadership in the church,” Msgr. Statnick said in the homily. Bishop Bosco was direct in conversation, Msgr. Statnick noted. But, the bishop was like the stranger — the unrecognized Christ — in Luke’s account of the journey on the road to Emmaus, which was the Gospel reading for the funeral Mass. Bishop Bosco promulgated “Journey of a Lifetime,” which focuses on education in the Catholic faith as a lifelong process, and “Taste and See: Catechesis as Food for the Journey,” the diocesan catechetical guidelines. In 2000, he launched the diocese’s first capital campaign, which raised more than $28 million and established diocesan endowments that support education of the laity. Bishop Bosco was active in the media, working with KDKA radio in Pittsburgh during Vatican II; hosting a television program; writing a column (“A View from the Bridge”) for The Catholic Accent, the diocese’s newspaper; and providing commentary for the radio show, “Accent on the Air.” He also chaired the U.S. bishops’ communication committee. In 2001, Bishop Bosco issued a pastoral letter, “On Bended Knee: The Eucharist and Service,” and he received the Bishop John England Award, which is given by the Catholic Press Association to publishers in the Catholic press for their defense of freedom of the press and freedom of religion. After retiring in 2004, Bishop Bosco continued to teach. He taught a world religions course at Seton Hill University in Greensburg, was a facilitator for the University of Dayton’s Virtual Learning Community for Faith Formation and led a neighborhood Bible study group in his home. He continued to celebrate weekend Masses at Blessed Sacrament Cathedral and had celebrated Mass there just three days before his death. Bishop Bosco received a Lifetime Achievement Award at the 2010 Communities of Salt and Light Awards dinner, a Catholic Charities fundraiser that he initiated in 1999 to help provide additional assistance to the needy in the diocese. Bishop Bosco led by “sharing the journey, walking with the flock, guiding it and directing it from within, and often in a more casual, indirect and personal way,” Msgr. Statnick said. Many of his columns were about ordinary situations and how to move forward through them faithfully, Msgr. Statnick said. “Through your witness and the witness you taught us to share with each other, we grew into a community of disciples led by you, our shepherd-disciple, who with the divine stranger, the Good Shepherd, alongside was leading us all,” Msgr. Statnick said. Zufelt is the editor of The Catholic Accent, newspaper of the Diocese of Greensburg, Pa.